On February 23rd, Russia celebrates its men. Although this holiday has a military history, first celebrated around WWI, it has evolved to become Russia’s somewhat odd counterpart to Women’s Day on March 8th. On February 23rd, Russian women (and sometimes men) celebrate the important men in their lives – fathers, brothers, teachers and even co-workers. This holiday is also the Russian equivalent of Father’s Day in other Western countries (which has not traditionally been celebrated in Russia). Defender of the Fatherland Day (or Men’s Day) is a truly Russian creation, first observed to mark the date of the creation of the Red (Soviet) Army in 1918. The holiday was originally known as Red Army Day, and then Soviet Army and Navy Day; in 2002 it was given its current name, Defender of the Fatherland Day by President Putin and declared an official public holiday. Although some more feminist societies may find issue with the concept of celebrating a “Men’s Day”, in Russia it is not seen as strange, offensive or inappropriate. While Russian society can be quite (frustratingly) patriarchal, nonetheless it is widely accepted by both sexes that both men and women have put a lot of work into the prosperity and success of Russia. Men, in particular, helped to do so by fighting in the wars, and their military achievements are the reason for this day. However, even if the men in one’s life have not been involved in war, it is still seen as polite and important to at least recognize them on February 23rd. In part this is because Women’s Day is so widely celebrated – to forget to celebrate Women’s Day is considered quite rude in Russia – and Men’s Day is a way to recognize that men and women are both important to one another. Men’s Day celebrations are usually smaller and more perfunctory than Women’s Day ones – except the public celebrations and parades, which conversely are much bigger for Men’s Day. Although the day has become a way to celebrate men as a whole, the public celebrations of February 23rd remain centered around Russian soldiers and military achievements. Particularly, parades and ceremonies throughout Russia honor soldiers past and present and war veterans; military stories and films are shown on television. In this way, the holiday is similar to Remembrance Day in Canada and Veterans’ Day in the U.S. 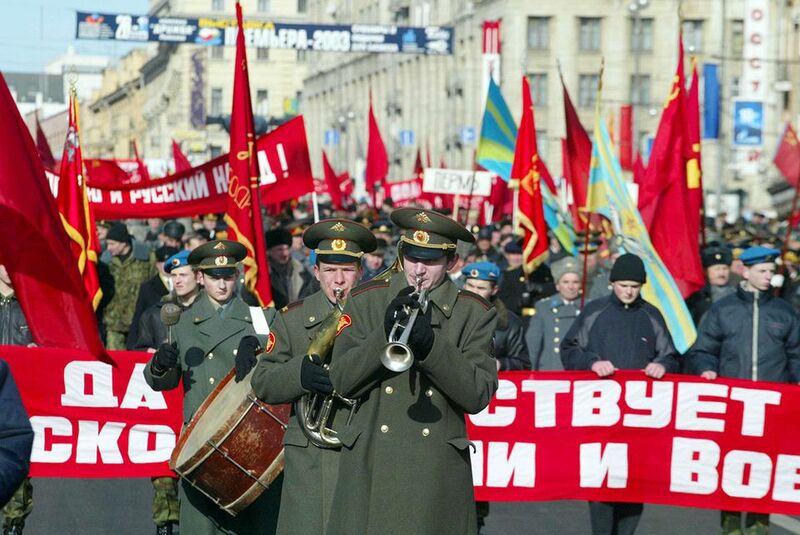 In contrast to the public (military-centric) celebrations, private celebrations of “Defender of the Fatherland” Day are mostly not at all related to military achievements, unless an important man in one’s life is or has been a soldier. On February 23rd, women give important men in their lives gifts of appreciation. These gifts can range from relatively small and impersonal (socks, cologne) to the expensive (watches & accessories) and highly personal (trips, experiences). Flowers and chocolate are not usually given to anyone on this day. Often, women will cook a celebratory dinner at home. It is not common for couples to go out to celebrate this day, unlike on Women’s Day. At school, kids sometimes bring cards for their male teachers and make themed arts & crafts projects to bring home to their fathers and grandfathers. Since most offices and workplaces are closed on February 23rd, as it is a public holiday, many offices have a small celebration the day before or after. Men usually get small gifts and everyone celebrates with a glass of champagne and sometimes a slice of cake. Typically, coworkers do not buy gifts for each other unless they are very close friends.